Enormous quantities of public money are spent on transportation infrastructure (TI). According to the Bureau of Transportation Statistics this infrastructure spend in the U.S. amounted to almost $90 billion in 2001. In most political spheres, when public money is spent, the public demands a measure of accountability. The dimensions of this accountability depend on the character of the political system that funds TI. In most participatory democracies, ultimate accountability is exercised through a balloting system that ensures elected officials represent, to some degree, stakeholder views and preferences. However, despite enormous expenditure of public monies on TI, this type of accountability is clearly lacking. In particular, the quality of public involvement in TI planning and design is acknowledged to be deficient by the public and by many professionals. Since the public’s money is being spent, it behooves professionals to improve this situation. Our programmatic aim is to improve public satisfaction with both TI design process and product. 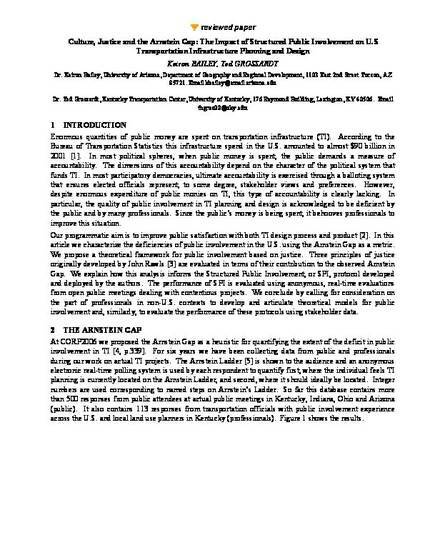 In this article we characterize the deficiencies of public involvement in the U.S. using the Arnstein Gap as a metric. We propose a theoretical framework for public involvement based on justice. Three principles of justice originally developed by John Rawls are evaluated in terms of their contribution to the observed Arnstein Gap. We explain how this analysis informs the Structured Public Involvement, or SPI, protocol developed and deployed by the authors. The performance of SPI is evaluated using anonymous, real-time evaluations from open public meetings dealing with contentious projects. We conclude by calling for consideration on the part of professionals in non-U. S. contexts to develop and articulate theoretical models for public involvement and, similarly, to evaluate the performance of these protocols using stakeholder data. Published in Proceedings of Real CORP 2007, p. 283-290.